Civil Engineering is known as a versatile branch of engineering and it constitutes design, planning, management and construction of the environment. It is known for being an oldest engineering branch that covers a number of applications in the maintenance and construction of canals, roads, dams, bridges, buildings, etc. Among the total number of 16 IITs, just 11 ISM and IITs, Dhanbad are providing the course of Civil engineering in India. 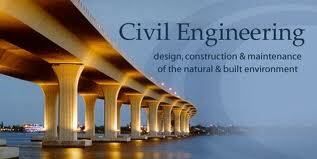 Out of the total number of 9,867 seats, just 891 are reserved for the Civil Engineering aspirants. In total, it just accounts only 9 percent of the total number of seats available. Thus, from this one can understand how difficult it is to get admission in civil engineering in IITS. In fact, it is getting more and more competitive with the passing time. As per the JEE Main 2014 results declared on 3rd May, only qualifying students able to sit for the JEE Advanced2014 conducted on 25th of May 2014. Out of the total 13.5 lakhs aspirants who registered for the JEE Mains 2014, just 1.5 lakhs able to sit for the JEE Advanced. Aspiring candidates of JEE Advanced 2014 can check the seat availability in 2013 for Civil Engineering in ISM and IITs, Dhanbad to get an idea about the process of screening. Accordingly, there was only about 4 IITs that had more than 100 seats - IIT Delhi (109), IIT Roorkee (135), IIT Kanpur (105) and IIT Bombay (117). As there are only 11 ISM and IITS, Dhanbad providing this course, therefore 891 seats is not a small number. In 2013, most of the IITs offered around 50 seats. JEE Main 2014 Rank Predictor is a simple tool that can be used easily in order to estimate the Rank of JEE Main 2014. This tool helps students appeared for the JEE Main to predict their rank in the exam. As the marks are now declared officially, you can even predict your chances of qualifying with the use of Rank Predictor. To know about college selection, preparation for entrance exam and counselling selection you can browse online.